Nike has engineered a cover-up that effectively wicks sweat while keeping you warm. 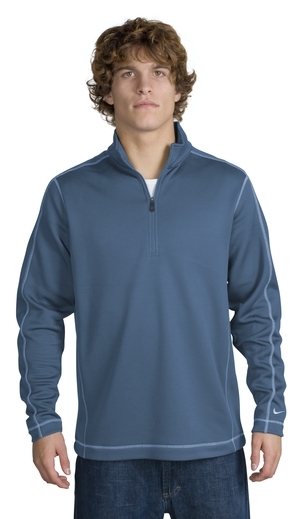 With a 1/4 zip that lets you breathe and move, this cover-up has distinctive contrast stitching and an open hem. Constructed with Nike Sphere Dry technology to wick moisture while retaining body heat. The design includes a self-fabric collar and open cuffs. The contrast Swoosh design trademark is embroidered on the lower left sleeve. In 100% polyester. Logo is a standard color, with placement on the left chest.